Created to travel alongside The Freddie Mercury Memorial Quilt (see Panel below this one on this block). 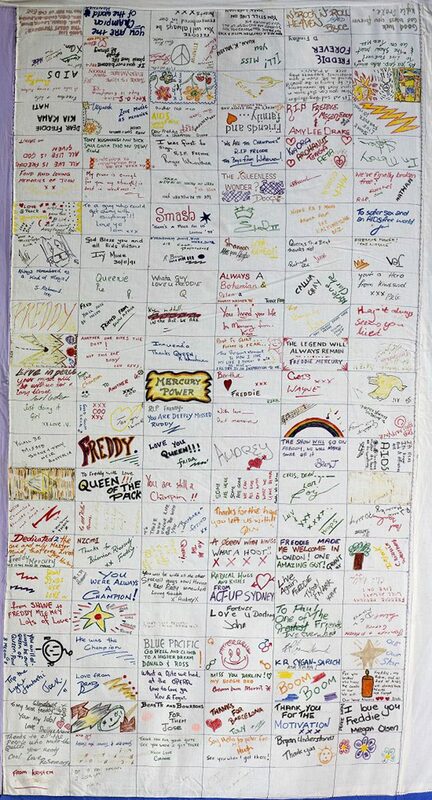 This Quilt was sewn as a fundraiser whereby the community was asked to donate a sum of money towards The Quilt Project and for that, they could write a tribute to Freddie Mercury in one of the 144 squares. So the makers of this Quilt are all those wonderful people who gave both their special thoughts about Freddie and their money to such a terrific cause. There were some people who thought it was a bit tasteless, but the majority were really responsive and supportive. The panel was taken to The Bar/Staircase, Vulcan Lane, QE II Square, and Downtown. While out and about, it gave us a great chance to spread the word, both for The Quilt Project and HIV education. It was a lot of hard work but we felt truly rewarded afterwards with the tremendous support. Written by Nicki Eddy on behalf of Warren Butler and all the others who contributed.